Never underestimate the power of touch. 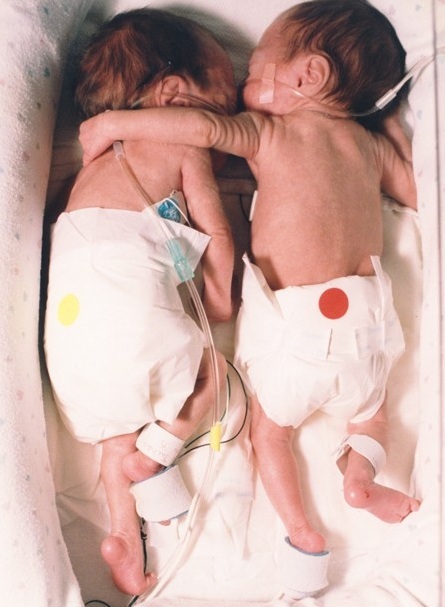 The video above describes twin sisters born on 17 October 1995 in Worcester, Massachusetts twelve weeks premature. They were both weighed about two pounds (about 900 grams). When Brielle Jackson went into respiratory distress, Gayle Kasparian, an NICU nurse, put her healthier sister Kyrie in the incubator with her. This allowed skin-to-skin contact and Brielle immediately stabilized. This and similar practices have been since termed "Kangaroo Care" and the practice with premature infants has been called "co-bedding". It improves oxygen levels in blood, reduces apnea, engenders better weight gain, leads to decreased agitation, reduced hospital length-of-stay, less chance of readmission and better temperature regulation. Hugging/cuddling also strengthens the immune system, reduces anxiety, helps depression, lowers blood pressure and improves sleep quality. The human touch is a powerful thing. Do not squander it. Both Brielle and Kyrie are healthy are now high school juniors.